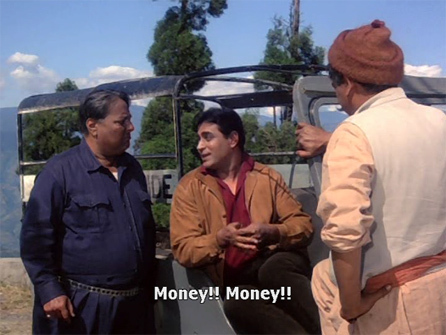 Sanjay (Rajendra Kumar) is a tour guide in Darjeeling who shares a house with his best friend Hanuman Singh (Rajendranath). This is a loony role even by Rajendranath’s standards; sometimes he’s so funny I just had to laugh even while shaking my head at his antics—and Rajendra Kumar is the perfect deadpan foil for him. The owner of Sanjay’s jeep, Motumal (Ram Avtar), wants to repo it since it isn’t paid for, and Sanjay devotes a lot of time and energy either bluffing him into believing payment is imminent or avoiding him. A gaggle of girl tourists have hired Sanjay to take them around Darjeeling. Their leader is Priya (Saira Banu), a wealthy girl from Calcutta, and Sanjay is has fallen head over heels for her at first sight. It takes some time, some songs, and a number of ill-conceived plots, but he finally wins her heart in return. Their new-found bliss is short-lived, however. 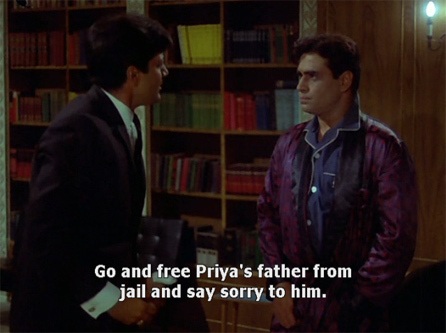 Priya gets a letter from Calcutta, telling her that her father has been arrested. He works for two brothers who are ruthless in character and have amassed great amounts of wealth using dubious means. They have framed him on charges of embezzlement. 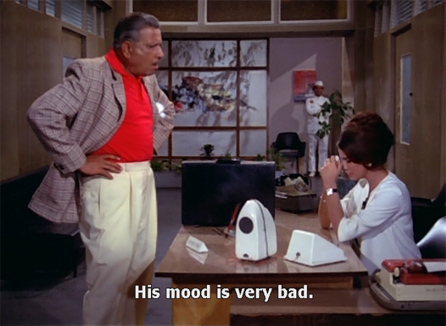 Sanjay takes Priya to the airport for her flight home. 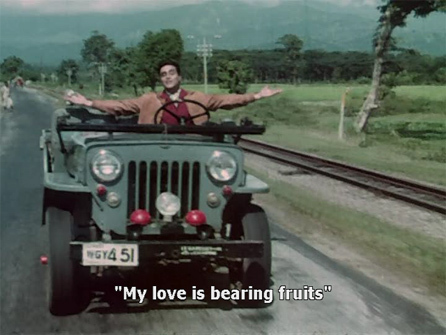 On the way back, he sings the lovely “Kaun Hai Jo Sapnon Mein Aaya” as he speeds along in his jeep. It’s wonderful song, bursting with the joy of new love—and especially poignant since you know he is about to die. Sure enough, rounding a corner he swerves to avoid an oncoming truck and is thrown from the jeep as it bounces down the steep mountain side. The humanity! As he lies there bleeding, a dark figure appears over him. Considering the fact that this was made in 1968, the special effects were actually generally very good. 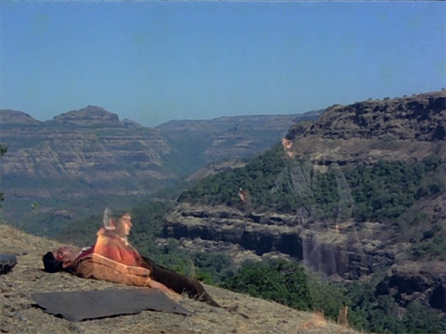 Anyway, Sanjay leaves his body and goes with the dark angel; but it takes him awhile to comprehend that he’s dead. Sanjay is not supposed to be dead. Oops! This causes quite the flutter in filmi heaven (which, by the way, is enormously entertaining). Alas. The fat crows of Darjeeling haven’t gotten Sanjay’s body, but Hanuman Singh has, and Sanjay’s body has already been cremated in front of his weeping friend and creditors. This doesn’t stump Bigwig Swami for long, though. 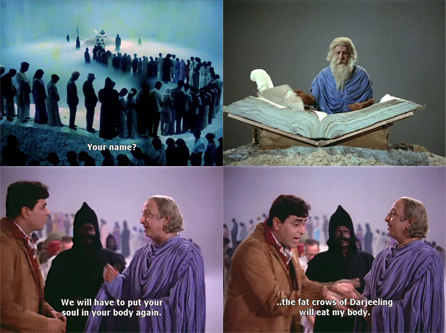 He tells Sanjay that there’s another body he can have, which incidentally belongs to a man who looks just like him, and who was the person who should have died anyway (hence Angel 702’s error in identification). This man is one of the brothers for whom Priya’s father worked. He is the elder brother, TK by name, and his younger brother Prem (Prem Chopra) wants to kill him and take over everything. Priya tells her jailed father that she will plead with TK—he doesn’t want her to have anything to do with them, and in fact has always kept her far away from them, but she’s insistent. 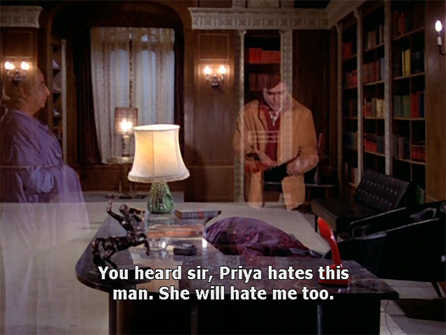 She meets with Prem, who is struck by an idea. 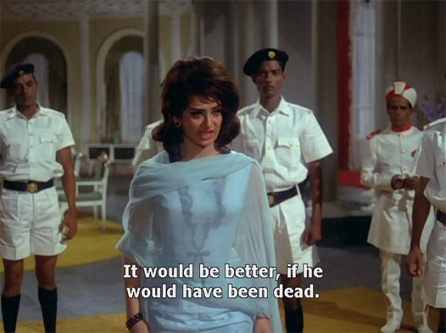 Prem shoots his brother and kills him just before Priya arrives. He escorts her to TK’s study and she goes in to find his dead body. Sanjay, watching, is horrified as Prem calls the police to have her arrested for TK’s murder. The only way to save her of course, is to take over TK’s body, which he agrees to do although he has one slight reservation. Bigwig Swami tells Sanjay that he will have to wipe clean TK’s bad deeds (his bag of bad deeds! ), and assures him that Priya and Hanuman will recognize him if he does so. Sanjay enters TK’s body, and the police arrive to find TK alive and well at his desk. 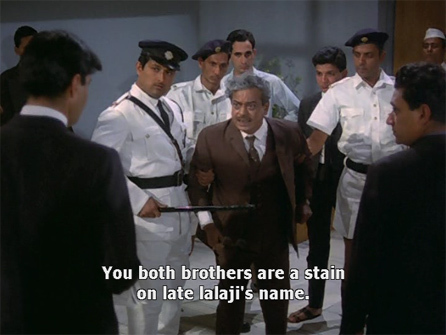 The Inspector (Jagdish Raj—is he always a police inspector?) sends Prem in to see for himself, and tells Priya she’s free to go and that TK isn’t dead. She’s hardly placated! Her hair is sprayed into an unbelievable helmet throughout, just FYI. She storms off and a confused and frightened Prem faces his brother. Over the next few days Sanjay adjusts to being the malik with everyone jumping at his every whim; his servants try to adapt to a boss who has suddenly stopped drinking champagne and drinks chai instead, and his lawyers and employees struggle to comprehend his changed policies. 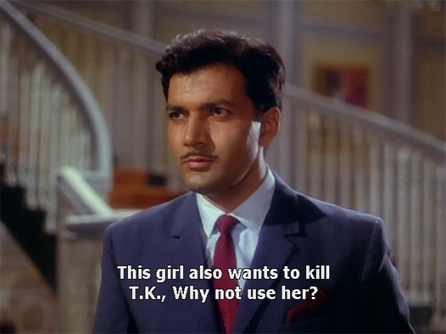 TK’s secretary Rita (Parveen Choudhary), who was romantically involved with TK, is especially bewildered by his vehement rejection of her advances. TK has been estranged from his grandmother for some years, but when her doctor calls to say she’s very ill, he goes immediately to see her. His servants Ram Das (Krishan Dhawan) and Devi Das (Brahm Bhardwaj) are overjoyed at TK’s transformation into a nice guy with a heart. 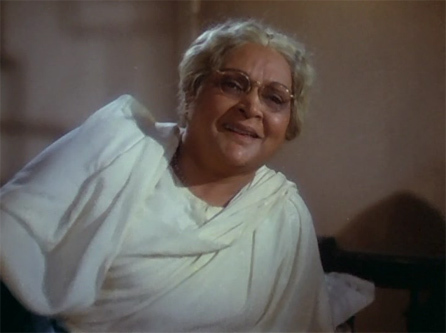 Daadima (Durga Khote) is a bit of a cranky old lady herself, but she is overjoyed to see her grandson and they make up. 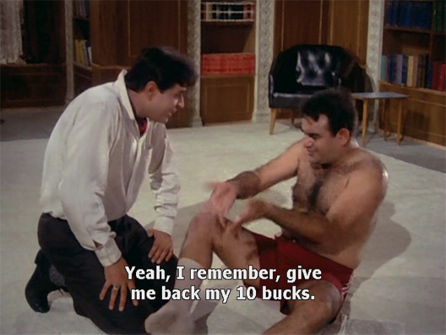 Sanjay then writes to Hanuman pretending to be an insurance agent, telling him that Sanjay had left him 10,000 Rs. in his will and that he must come to Calcutta. 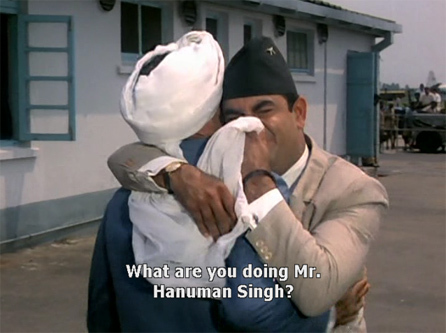 He sends Ram Das to meet Hanuman at the airport. After some comedy bits involving Hanuman fainting, being revived (Sanjay uses Hanuman’s shoe as smelling salts) and then screaming “Bhoot” and running around, Sanjay manages to convince Hanuman that it’s really him. Meanwhile, Rita the spurned secretary reminds Sanjay that she’s his wife: TK had married her! And Prem bhai isn’t done with his scheming, either. Can Sanjay make up for TK’s sordid past? Will Priya ever be able to love him again? And anyway, what about Rita? Watch Jhuk Gaya Aasman to find out. It’s a solidly heartwarming and funny entertainer! Posted on September 18, 2008 at 2:27 pm in Hindi movies	| RSS feed You can skip to the end and leave a reply. Thank you for posting this one. I want to watch the movie again now. It’s been ages or so it seems. I love this movie…. 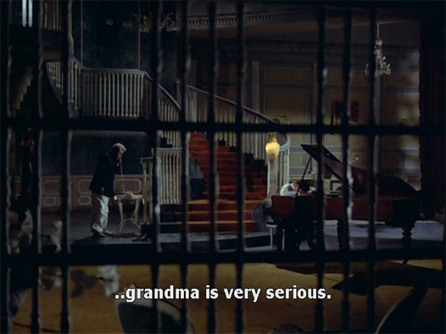 Have seen Here Comes Mr Jordan and though I like Robert Montgomery a lot, I like the Hindi version way better. 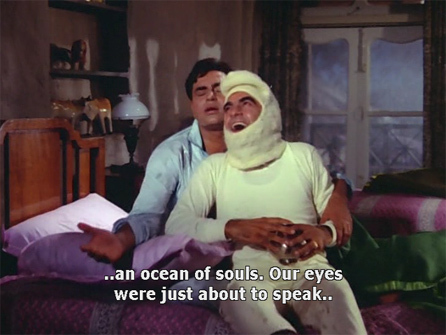 Rajendra Kumar is pretty effective in the comedy here (the heaven scene still makes me laugh after several watches) and even Saira Banu isnt too annoying. Its aged pretty well, too. Like Kannan I liked this as a kid and found that even as a grown-up I liked it. I can see why this would be a fave when you were a kid, and how it wouldn’t get old (my film like that is Chitty Chitty Bang Bang)…Rajendra Kumar IS lovely and Saira didn’t annoy too much. She’s not in it as much as she might be as the heroine, there’s so much other stuff going on. 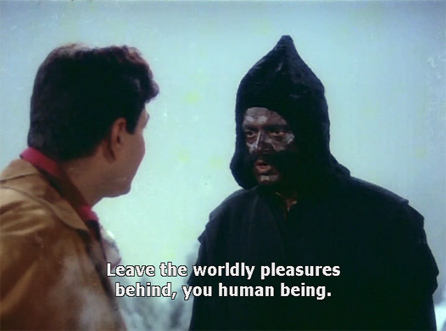 Prem Chopra was his usual creepy self. He was good looking when he was younger, but I can’t imagine him playing a nice guy. Would love to see it, actually. Hilarious :-) Don’t like Rajendra Kumar but anything shot in Darjeeling I will see. 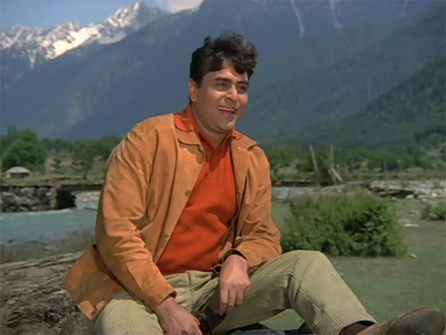 Or did they shoot in Himachal or Kashmir and call it Darj? That screencap no. 8 (out of body thing) looks like it could’ve been in the Western Ghats? 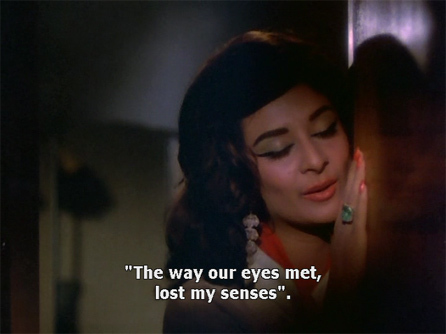 I’m not a Rajendra Kumar fan – and I find Saira Banu too shrill most of the time, but despite all of that, this is one of my favourite movies! Probably something to do with the fact that it’s got fabulous music… Unse mili nazar has got to be one of the best bathroom songs (why are there so many of them in 50’s and 60’s Bollywood? Literally bathroom singers?). This one actually reminds me of Bhai battoor in Padosan, especially since that’s also Saira Banu. That sounds like a really good story! Someone should remake it all over again. I do like Rajendra Kumar and he’s good in this :-) I don’t like Saira much, but she’s okay too. I don’t know where it was filmed, sadly I haven’t been either to Kashmir, HP or Assam (yet) but parts of it were definitely mountainous and beautiful. And the songs and the story are lovely :-) I guess another Hollywood version came out recently with Chris Rock, and though I think he’s one of the funniest people on the planet I think I’d rather see this one again. Banno—maybe YOU should make another Hindi version of it ;-P I’d watch it! Sadly, Rajendra Kumar never did it for me — I found him too weepy, too nondescript, and too prone to dying on celluloid. Radiation sickness, cancer, heart trouble, suicide, car crashes, you name it. He could almost be a Kennedy. This movie does sound very promising, though. I am especially intrigued by Angel 702. Will watch it sometime. Ramsu: LOL@prone to dying on celluloid :-) and your dad’s take on his success. He WAS called Jubilee Kumar after all! yaaaay sairaaaa!! i adore her in any movie ever made, including that annoying girlish laugh, and that eyeliner and fashion ohhhhffff! I need to look like that! i never liked rajendra coz he always was a sacrificial lamb for his friends and weepy in all movies I’ve seen, though his movie path seems the same as rajesh both jubilee kings and then slowly doing movies that live in the Backwass state of my Masala Pradesh! I’m sure Shammi’s movies live someewhere in the Pradesh! Um, add me to the list of Saira fans :D Love her in a very “awww, lookit that” sort of way. But even she couldn’t make me love this film. It’s one of those “I’ll watch if there’s nothing better on” sort of movies for me. But then I feel that way about a lot of Jubilee Kumar’s movies. Well, I would have liked Shammi and Asha to star in it, but it was still a fun story. This is one of the my favorite movie, i love the watch this movie again and again. Character of Sanjay is really amazing, no one could have had made the same charcater that, Rajender did in this film. i know late shri Rajnder is not with us. and no body can fill his place. Outstanding music by Shankar Jaikishan. What an orchestra in Kaun hai jo sapno mein aaya…and Lata Mangeshkar sounds divine in Mere tumhaare beech mein ab toh na parbat na saagar (lovely interludes too) and so sensuous and impish in Unnse mili nazar. Rafi’s Kahan chal diye is sweet and naughty at the same time. And love the swaying rhythm in Sachha hai gar pyaar pyaar mera sanam. Other hits of Lekh Tandon include Professor, Prince, Dulhan Wahi Jo Piya Man Bhaaye, and though not a hit but nonetheless good film Doosri Dulhan. He acted as Aamir’s dadaji in Rang De Basanti. My dad’s great grandma delivered rajendra kumar. she was a midwife in pakistan. Loved this one a lot until I saw Here Comes Mr Jordan (that desperate dialogue about recognizing one’s `old love’ still makes my heart flutter) and ughh! Heaven Can Wait (Julie Christie!). Unse Mili Nazar was the song for us girls in IXth grade. Lata could sound very breathy when she wanted to. Yes, Aan milo sajana is a beautiful song, it grew on me suddenly about two years ago. Kaun hai jo sapnon mein aaya is what we would call a `dhaapela’ (`inspired’) tune, but nicely dhaapela. And you would rather have our Shammi Kapoor bumped off in this one? NEVER. I did read your `Shama Parwana’ and am still reeling. This one is ok but it does have one of my all time favorite songs Koon he Jo sapano mee haia. The Warren Beaty version wa fairly weak too and here comes mr. Jordan had Robert Montegomery whom I don’t like that much. I think the best version of this story is a Telague movie called Younga Domnga(?) with NTR jr. Frankly South Hindi movies are so much better than their Bollywood counter parts these days. 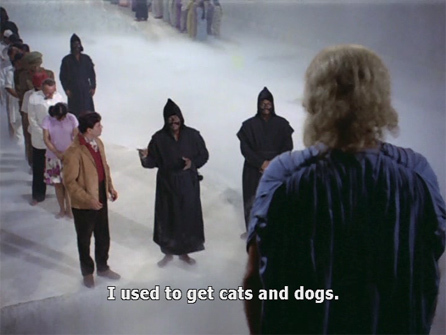 And if you really like ishtylish cinema you should watch some 70’s Tolyywood cinema!